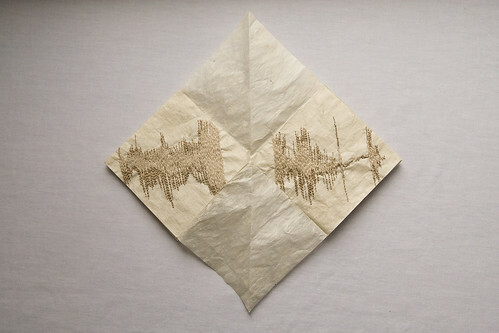 Alisa Banks has two pieces from her Edges series included in the Modest in Scale exhibition at Abecedarian Gallery. This is the first I’ve seen of her work, and I am pleased to have the opportunity to both examine her work and learn more about the conceptual development of these particular pieces. Alisa is a visual artist whose work explores aspects of identity including notions of home, the body and Southern Louisiana culture. She often incorporates fibers and found materials that in form reference traditional crafts. She currently lives in Dallas, TX. 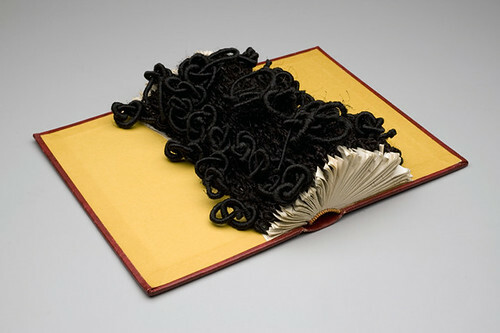 Her repurposed books have immediate visual appeal as standalone sculptural objects; their craft and technique are satisfying. Happily, they go beyond craft and novelty of approach as Alisa is also addressing content and concept in an intelligent and sophisticated manner. 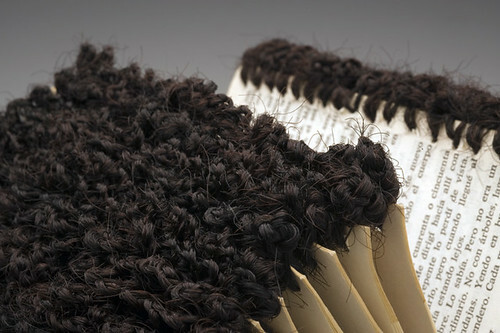 Edges is a series of 4, each with a different edge treatment based on African/African ancestry braided hair styles and are titled based on the style and the method of braiding: corn-rowing, twisting, lace braiding, and thread wrapping. Instead of manipulating the hair solely by hand, I crocheted the hair to the base, or page edge of each book (except for Twist, which is closer to latch-hooking). Lace braid is actually lace crocheted using hair. I say that, because it does not look exactly as a lace-braided hairstyle. The Edges series of books is one of several that utilize hair (usually synthetic,but sometimes human) in some fashion. Hair culture is a recurring theme in my work in part because it (hair) is highly personal and highly subject to social codes even within cultural groups. In the various pieces, hair is used to convey messages by the manner in which it is treated, by the styling of the hair, and titling of the work. As a side note, I find it interesting that styles considered current are often similar to much older, even ancient styles, whose meanings are long forgotten. The books were chosen primarily because of their intimate size and because they are written in Spanish, however the actual stories do not relate to the overall piece. During the time I created the series, there was much heated political dialog on the national, state and local level concerning (illegal) immigration. Often the dialog took an underlying tone of intolerance and had little to do with immigration status. The tones of intolerance (which were cross-cultural), reminded me of growing up in the 60’s and 70’s during integration. My intent was to use the hair treatment in a way that would show how much activity, creativity and life happens on the “edges” of mainstream society, regardless of whether or not it is recognized. By the way, the term “edges” in African American hair culture refers to the parts of the hair that are most challenging to deal with – in other words, the parts of the hair that do not “act” or “look” like the rest. Mixed-media artist Wendy Kowynia is one of four recipients of the Modest in Scale exhibition awards. Included in the exhibit are two pieces from her Iterations Series. 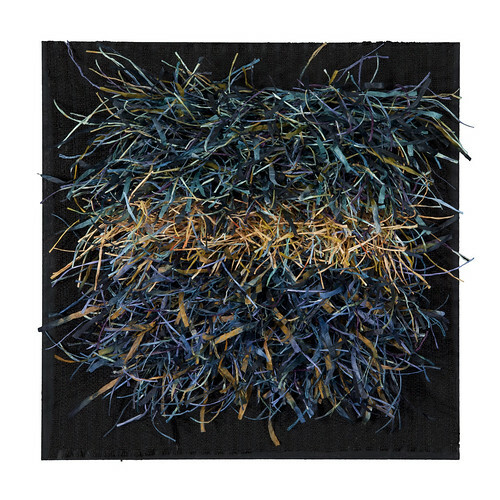 In this work Wendy explores material, technique, and technology. She is using paper yarns of linen, bamboo, pine and silk, painted and dyed that are knotted, woven, twined and laced on a loom. Iteration is the essential act of weaving; to do again and again and again, with each completion coming more closely to the desired result. Wendy finds solace in this requirement of her chosen medium: the work evolves out of this simple dedication to repetition. As an artist working in textiles, my work has an inherent element of surface; I create the surface, and the surface becomes the art. The Iteration Series is woven in linen, the painter’s traditional canvas. Iteration 11 is painted with oil stick on the warp threads, then woven. Iteration 12 is knotted paper yarn. Wendy Kowynia has lived and worked in Steamboat Springs since 1991. Her career in textiles began in 1983. Wendy completed her BS degree from Smith College in 1982, where she majored in studio art, with a focus in painting. I am looking forward to featuring more of her work next year. Erin Paulson is one of four Modest In Scale award recipients. 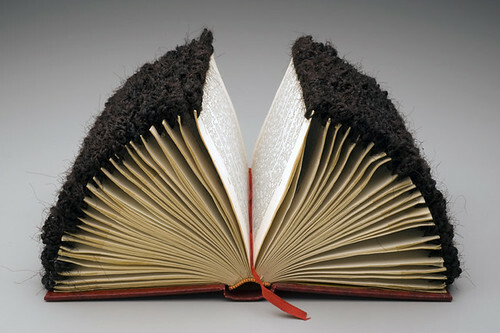 Erin is a bookbinder, paper maker, and photographer living in Philadelphia where she is pursuing an MFA in book arts and printmaking from the University of the Arts. 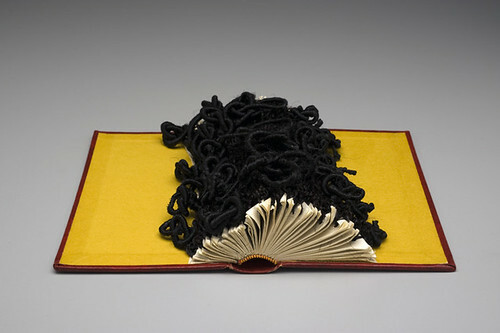 On exhibit in Modest in Scale are two sculptural bookwork pieces made with handmade paper and other fibers. What is other wise lost is made with handmade flax paper silk thread linen pig suede and found objects. 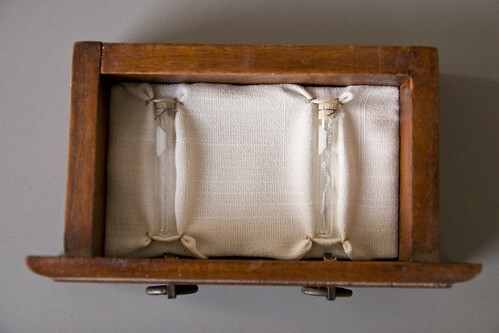 It is housed in a miniature chest of drawers; each of the five drawers containing an elegantly arranged set of objects. In this work Erin’s attention to hand skills and reverence for simple materials is evident. With what is otherwise lost, I sought to create the tangible out of the intangible by blending elements of science and sentiment to create objects with which the viewer can interact. These transfer the elusive concepts of truth, memory, and a record of feelings past or present into a physical presence, defined and contained. The imagery references science, astronomy, astrology, and the mapping of places that don’t exist beyond the mind’s eye, while the writings describe a time and place. There is an element of magic present: the quality of the unexplained, of the potential, of the celestial, that all relate to an interest in our often inaccurate perceptions of memory. The second piece on display is called I was screaming and no one could hear. It is made with handmade kozo paper, LED lights and book cloth. 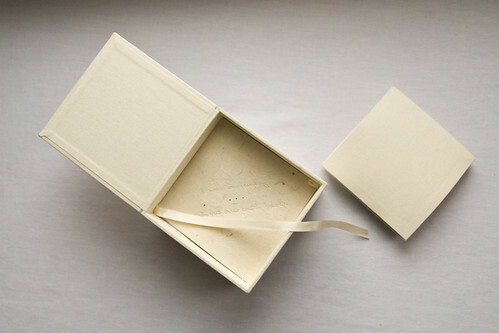 In this piece, a box houses a folded book structure, the pages heavy with embroidered lines, resting in a box, the base of which has small holes, like pinpricks, that form the book’s title. Beneath the base are LED lights that, when turned on, illuminate the word forming dots. As a teenager I developed a series of neurotic behaviors, including a debilitating stutter. Since that time my work has been the outlet by which I enforce my determination to never again become unfettered, lose my confidence, or slip into the neuroses of my past. It is the struggle for composure over chaos, and the minute, almost indiscernible divide of which I must remain constantly aware to maintain my balance. I was screaming and no one could hear is an artist book comprised of handmade kozo paper and a hand-embroidered sound wave of my voice striving to overcome stuttering while reciting the title. The repetitive action of the embroidery relates to the daily struggle of a former stutterer to speak with clarity. This piece is the visualization of the daily battle to conquer my speech impediment – the successes and the failures, the internal struggle and the external symptoms, the journey traversed and the finish line perceived. Aram is a Korean born multi media artist whose family immigrated to Modesto California when Aram was five years old. Her undergraduate work focused on art and Latin American studies. She worked primarily in figurative ceramics, studying under Richard Shaw at the University of California Berkeley. She then received her post baccalaureate certificate in fine arts at Maryland Institute of Art. 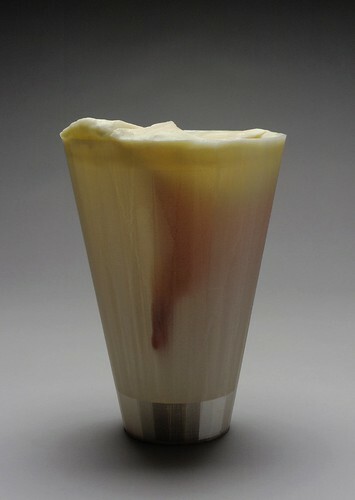 Aram is currently working towards an MFA in fiber and material studies at the School of the Art Institute of Chicago. The piece in the Modest in Scale exhibition is called Ornament and Order and is made using a shirt collar with white rice and thread. Ornament and Order is one of several works inspired by the traditional South, Southeast, and East Asian mythology of the Rice Goddess or Rice Mother. In many versions the mother is killed and the first rice grows from her body. Rice now feeds over half the total world population today; the feeding of countless bodies traced back to first rice. Aram grew up in an immigrant family and watched her mother sacrifice her dreams and much of her happiness to provide for and feed her family. 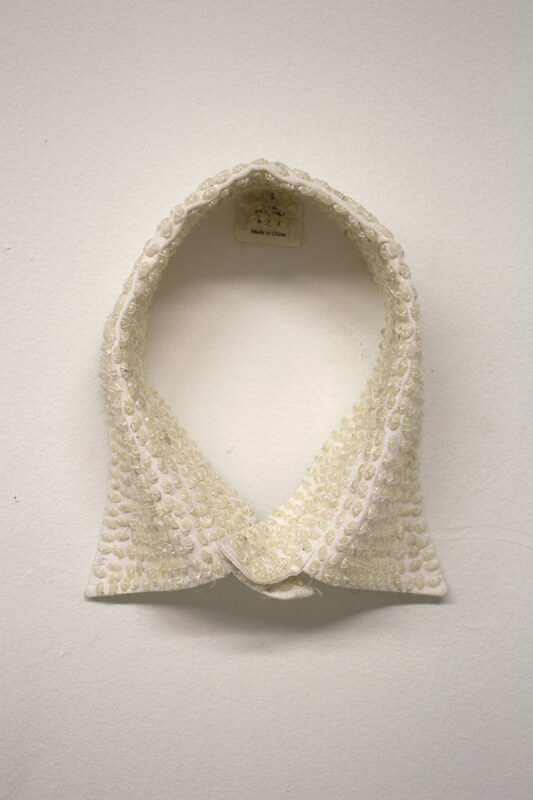 Aran mimics her mother’s work as a seamstress and stitches grains of rice onto garments. She is inspired by Joseph Campbell’s suggestion to look to mythology to create metaphors to understand our daily lives. In this series the artist is connecting the life of the immigrant mother with the mythological rice mother. I look forward to learning more about Aram and her work over the course of the coming year as we plan an exhibit to featureing her work os one of the four Modest In Scale award recipients. I have appreciated Lauren Scanlon’s work since I first saw a presentation given by her at a conference several years ago. When I began the curatorial process for the Drawn and Quarto exhibit at Abecedarian Gallery I contacted Lauren to see if any of her current projects might fit the theme. After some consideration Lauren agreed to create a body of work specifically for this exhibit. Lauren pulled it off even though she married, honeymooned, moved across country, then temporarily relocated to Canada, all during the brief time she had available to create this work. In addition to all of these complications, her camera and many studio supplies were stolen while she was on the road. Her perseverance paid off with a wonderful body of work that includes drawings on pages taken from books alongside a series of ‘shrouded’ books. My recent work uses bedsheet designs as an entry point for investigating the pattern, structure and impact of a specific line of romance novels that I read when I was very young (10 years old). These novels were published as a more highly sexualized line of romance reading (than was currently available at the time). In structure, the novels are thinly veiled recreations of classic fairytales such as Cinderella, Snow White or Bluebeard. Familiar situations and characters are present including cruel stepmothers, frightening husbands, and disenfranchised heroines in need of rescue. Having read them so young, my perception of them as fairytales is even more pronounced. In many ways, these romance-novel-fairy-tales are much closer to the stories told by the Grimms Brothers than those told to us by Disney. Both the Grimms Tales and these romance stories contain truly frightening imagery – sexuality, violence and cruelty – that has largely been removed from recent fairytale incarnations as presented to us by contemporary narrators (in films like Cinderella Man or animated works by Disney). 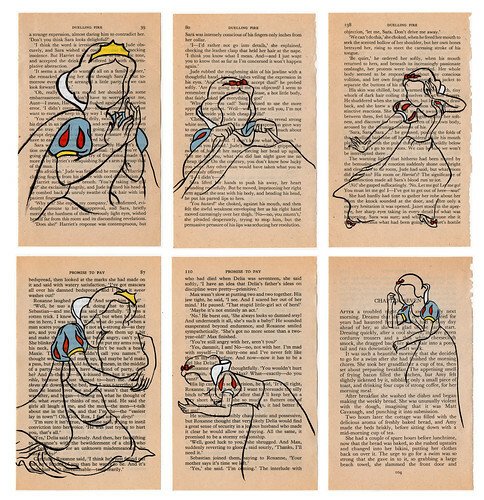 The drawings presented here highlight the fairytale elements of the books while at the same time leaving the text available for you to read. Where possible, the images reflect some aspect of the narrative. The objects are shrouded books. 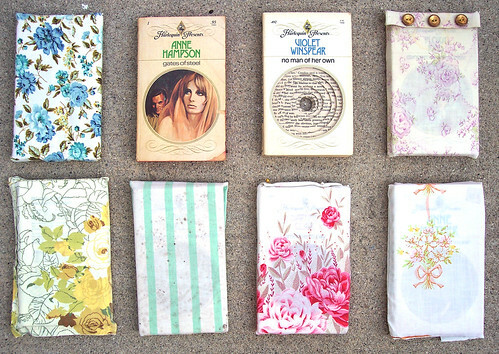 They are the exact romance novels that I read as a kid. They have been carved (eviscerated) with an exacto knife and shrouded for burial using domestic fabrics and gold thread. The use of bedsheets, pillowcases and curtains connects the text to the domestic realm and the specific location of a bedtime story. The decorative, often floral, patterns distract from the dark revelations of the text. This renders them relatively harmless and is an attempt to – figuratively speaking – put them to bed. The career of Jim Johnson is one of diversity of approach with specificity of purpose. Trained as a painter, early in his career he began to experiment with new media such as video, collage, photocopies, correspondence art and books. 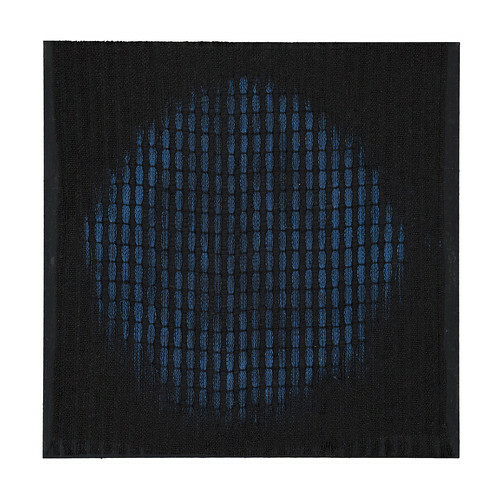 From his first exposure to the international Concrete Poetry movement in the late sixties, Jim’s work has consistently moved in the direction of discovery and away from expression. Visitors to the Denver Art Museum have likely seen his book/installation, A Thousand Words is in the Denver Art Museum’s Permanent Collection. He has created numerous one-of-a-kind books as well as limited and open editions, a selection of which is on display in the Reading Room this fall. The exhibit includes a selection of books using the versatile folio format. Jim works with the versatility of the folio, the notion that each collection of folios (or ‘book’) exists as both multiple sheets and a single object. He treats the form as a collection that can be read in sequence or disassembled and viewed or framed together or individually. Jim was a a member of the Painting and Drawing faculty of the Department of Art & Art History at the University of Colorado at Boulder since 1970. He developed the department’s Integrated Media and Computer Imaging programs and was instrumental in developing the Center for Arts, Media and Performance for the ATLAS Institute and served as it’s first Director. Abecedarian will host an informal talk and reception for Jim on October 19, from 6-8pm.